Site: Plant in warm, moist soil in a sunny location with midday shade. Good sun and moisture are necessary for the production of essential oil and good fragrance. Growing: This vigorous plant will readily spread in your herb garden. It reaches a height of 3 feet with a spread of 2 feet. The oval, heart-shaped leaves have slightly serrated edges and a pronounced network of veins; they can be up to 2½ inches across. Cut back to soil level in the fall to encourage strong growth. The plant will not tolerate high humidity. 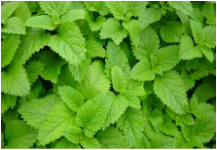 Lemon Balm also performs well in containers. Harvesting: Pick the leaves of this fragile herb anytime, but handle gently to avoid bruising. The flavor of the leaves is optimum just as the small, white flowers begin to open from mid to late summer. Culinary Uses: Use fresh leaves in sparingly in salads and as a garnish for fish and other dishes. Chopped leaves can be added to fish and chicken dishes and sprinkled over fresh vegetables. Add the leaves to cooked dishes in the last few minutes. They can also be added to summer drinks and fruit salads, and make a good substitute for lemon peel in jams and jelly recipes.